This was all in good fun, but not to be taken seriously. Not that it wasn’t true, mind you — the European Union really is a totalitarian superstate, albeit with more of an emphasis on the velvet glove than the iron fist — but it hardly seemed likely that the EU would ever adopt overtly Communist symbols as its own. 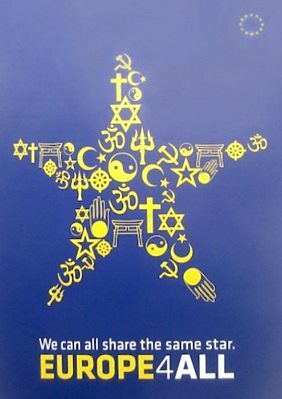 As pointed out today by Daniel Hannan, and commented on by numerous others, the EU has now elevated the beloved hammer-’n’-sickle to the very apex of its all-inclusive multiculti star of ever-closer union. Obviously, the paladins of Brussels find the paramount symbol of Soviet Communism acceptable, and possibly even to be held in high esteem. It doesn’t remind them of a brutal jack-booted repressive ideology that has left more than a hundred million corpses in its wake. Or, if it does, they’re not bothered about such trivialities. Petty people like me think about the eggs, but they’ve got their eyes fixed on all those lovely omelets. First of all, the person who designed it seems to consider the hammer and sickle a religious symbol. Now, that’s perfectly appropriate. It’s what we right-wing extremists have been saying all along, but it’s nice to see the Powers That Be acknowledge the fact. The other symbols are vaguely reminiscent of those ubiquitous Soros-funded “COEXIST” bumper stickers, but with a few additional religions thrown into the mix. The hand icon is a symbol of Jainism, for example. The little wheel is for Buddhism, and the yin-yang is for Taoism. Funnily enough, there seem to be two symbols for Hinduism, and none for Sikhism. The Om icon is familiar to most people, but the Trishula, which looks like a trident, is less well-known. I tend to think that the designer — who perhaps skipped a few lectures in his Comparative Religions course — mistook the Trishula for the well-known Sikh icon with its crossed swords surrounding a double-edged blade. Finally, there is the plain star. What is that supposed to represent? Communism again, perhaps, but the Maoist variety this time? Or does it stand for paganism? If so, I would expect it to be a pentagram rather than a regular five-pointed star. Would the poem below worry anyone if the Star were the antichrist and the darkness was the evil that bound all peoples into slavery? P.S. In reading about the Sikh symbol, it is clear that the symbol was omitted because it might inspire people to become warriors to fight the antichrist. The Bahá'í Faith is a variant of Islam. "The five-pointed star is the symbol of the Bahá'í Faith. In the Bahá'í Faith, the star is known as the Haykal (Arabic: "temple"‎), and it was initiated and established by the Báb. The Báb and Bahá'u'lláh wrote various works in the form of a pentagram." The topmost Islam symbol is a bit higher than the cross, and higher than any other symbol except the hammer & sickle. This is in Europe, of all places; Europe, which struggled desperately for centuries to survive Islam's attempts to conquer it. Finally, there is the plain star. What is that supposed to represent? The Pentagram. The Witch's Star. No, the plain star and the pentagram are NOT the same symbol. That was my point. In the occult symbol, each of the five points must connect with the other four using straight lines, forming a star with interior crossings inscribed within a pentagon. At least that's what I understand the definition of "pentagram" to be. Is there an occult version of the plain old five-pointed star? This is the statement form Euope4all. The URL is long so I post the text! "From different people we received a mail with the question why we have a poster with a symbol of comunism ? Unfortanatly we have no idear who the owner is of that poster. The European project "Europe 4 All" and this website have nothing to do with this campaign / poster." Going way, way back, wouldn't it be natural to think that some artist mind would make up the five-pointed star as a symbol of man as it corresponds to the human body? Then, I have to say I do disagree to gathering religious symbols this way, placing the communist and islamic ideologies at the very top. Establishing this as a visual symbol, only serves one purpose, advancing islam. Looking at this symbol, you are supposed to get used to seeing the islamic symbol at the top, implying it being the most important, and thereby accepting islam as (...) the leading star! Just bow down to it, in dhimmitude! There are some strong psychological effects to this. Who is ideologically behind this Europe4All? The same as G4S? Who is G4S? The G4S is everywhere. "Read any newspaper article about G4S and you are more than likely to be told the company is the biggest employer on the London Stock Exchange, with over 650,000 staff and “operations” in more 125 countries. So if being big, doesn't give you the bottom line, why, then, be big? Major investors are big banks and state funds, like the Norwegian government. Why do they invest in this company, if profit is not a subject? Or, is it Profit, as in Profit not to be caricatured...? I think it is worth comparing these two, Europe4All and G4S. What is G4S' overall agenda? And, will it be in the overall interest of the Europeans? Why would Europeans want to have individuals of the totaliarian ideology search people to "protect" airports, museums, shops, events, state owned buildings, Olympic games, etc? What about their "values"? Looks more like an organization for infiltration, than anything else. What immense power do you have, as an ideology, if you have the power to control access in every country of the world via such a Big company? A dream for any ideology with imperialistic goals. Not only a dream, but a way. Europe4All, doesn't sound any different from "No one is illegal", or the sharia "right to asylum" anywhere in the world. Or ultimately, the caliphate. "Our size and scale means we touch the lives of millions of people across the globe and we have a duty and desire to ensure the influence we have makes a positive impact on the people and communities in which we work." - Looks like a good platform from which to do "charity" and dawa. "Happy Day - North Africa, Middle East and South Asia"
Not only Islam was defeated on the borders of Europe but Communism is meant to have been rolled back, except it never was, of course, hard communism became soft communism or cultural Marxism and the cultural Marxists have won for the moment. What intrigues me about this poster, apart from the hammer and sickle which have even disappeared from the Kremlin, haven't they?, is the fact that indigenous Europeans never voted for any of it. They never wanted Europe to be Europe for the whole world who have their own lands to live in. They wanted Europe to remain Christian and for indigenous Europeans. So perhaps somebody could ask Europe4all on whose behalf they purport to speak, how many indigenous Europeans ever did or ever would vote for this multicultural Marxist nonsense? Also, when will we hear of India for all, Africa for all, Pakistan for all, China for all, Japan for all. The answer is never!!!!!Why? I am so sick of the complete removal of democracy in Europe without any popular mandate and the smug superior air adopted by the brainless idiots who espouse it this Europe4all tripe, not an ounce of common sense or empathy for their fellow Europeans between them. In fact, of course, they prefer anybody who is not Christian and white. "The UAE Foreign Minister, Sheikh Abdullah bin Zayed al-Nahayan, publicly suggested that the Gulf countries to unite against the Muslim Brotherhood because it “does not believe in the nation state. It does not believe in the sovereignty of the state.”"
All of a sudden, the idea of the caliphate doesn't seem so great, after all? Second on his agenda in Norway, is allegedly showing his support to Mullah Krekar. Again, the number 4, a code for sharia or something? Following the tenets of Milestones by Sayyid Qutb, the Muslim Brotherhood advocates complete anarchy without any leaders. Each man is supposed to rule himself via perfect Sharia Law. The anarchy part is WHY these guys are ok destroying all governments - especially monarchies. P.S. I heard about Milestones from an FBI guy a few years ago. "Ma'alim fi al-Tariq, also Ma'alim fi'l-tareeq, (Arabic: معالم في الطريق) or Milestones, first published in 1964, is a short (12 chapters, 160 pages) book by Egyptian Islamist author Sayyid Qutb in which he lays out a plan and makes a call to action to re-create the Muslim world on strictly Qur'anic grounds, casting off what Qutb calls Jahiliyyah, the pre-Islamic ignorance that the world has lapsed into." "Ma'alim fi al-Tariq has been called "one of the most influential works in Arabic of the last half century". It is probably Qutb's most famous and influential work and one of the most influential Islamist tracts written. It has also become a manifesto for the ideology of "Qutbism". Commentators have both praised Milestones as a ground-breaking, inspirational work by a hero and a martyr, and reviled it as a prime example of unreasoning entitlement, self-pity, paranoia, and hatred that has been a major influence on Islamist terrorism." "English translations of the book are usually entitled simply "Milestones," the book is also sometimes referred to as "Signposts." The title Ma'alim fi al-Tariq translates into English as "Milestones Along the Way", "Signposts on the Road", or different combinations thereof." It’s just a variation of E Pluribus Unum. The blending of many into one. They will tell you that they will take the best from all philosophies, mingle it, and create the perfect philosophical one world utopia. What G-d has put asunder, let no man put together. It seems that all roads lead back to Babel.